Schwerin, Staatliches Museum, from September 1, 2007 through December 2, 2007. Previously Haarlem, Frans Hals Museum, from December 16, 2006 au through April 15, 2007 then Zürich, Kunsthaus, from April 27, 2007 through August 19, 2007. As the Rembrandt year draws to a close, bringing with it an ensuing number of publications, some of which are outstanding exhibition catalogues, art institutions and museum goers continue to show an interest in XVIIth C. Dutch painting. 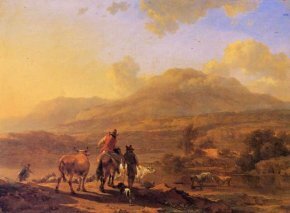 A few weeks ago, an important exhibition devoted to the Dutch painter Nicolaes Berchem ended at the Kunsthaus in Zurich. It had travelled earlier to Haarlem, at the Frans Hals Museum, and is now finishing its tour at the Staatliches Museum, in Schwerin through December 2, 2007. This retrospective, perhaps the most successful of any presented this year on Holland’s Golden Age, is significant for two reasons. The show highlights a critical figure in XVIIth C. landscape and historical painting but it also provides the curious visitor with the rare opportunity to discover an art that is more complex than might appear to be the case and especially – and even more uniquely – to explore a spatial concept and a staging (orchestrated in Zurich by the commissioner Christian Klemm) that never falls into triteness. It would have no doubt been easier, in order to reach a larger audience, to give in to the temptation of a “guided visit” leading, as is becoming more frequent, the viewer through the works. This approach would certainly not have been absurd, attracting and seducing the art lover and allowing him to discover a painter and a style of painting that was perhaps unfamiliar. This was not the intent however of the commissioners for this retrospective. The shape and uneven dimensions, as well as the ever-present décor of the five old galleries containing the exhibition, on the first floor of the Kunsthaus, must have made this a daunting task for Christian Klemm and his technicians. Thus, the visitor’s path leads him on a thematic journey : an entrance hall presents the first explanations on the Dutch Golden Age, the life of the painter and the artistic theme of Arcadia ; a second gallery contains the large formats ; a round cabinet room assembles small landscapes ; a fourth gallery displays paintings by other Dutch artists inspired by Italy ; and the last room illustrates Berchem’s talents as a draughtsman and engraver. However, presumably for lack of space and to balance the hanging, the commissioner did not choose to observe this arrangement scrupulously. For instance, the first gallery mixes works from Berchem’s “youth” with paintings executed at different moments of his career, in order to emphasize his extensive range of subjects. The same blending strikes the museum goer upon entering the second room, where horizontal and vertical formats mingle strangely, as do Jan Both’s and Jacob van Ruidael’s inspired landscapes with port scenes and historical or allegorical works. In contemplating this apparent confusion, the visitor lingers a bit longer to understand the suggested rapprochements, take in the quality of the paintings and, more prosaically after a better look, first close up, then from afar, compare them carefully. The exhibition is meant for a large viewing audience but makes clear demands on the visitor. And the main achievement of this Berchem retrospective is precisely to avoid easy complacency. By refusing to apply the strict (and obedient) principle of formal and iconographic uniformity, the commissioners ran the risk, and did so fully aware, of disconcerting visitors by presenting objects that may seem unrelated. The goal was to transform a retrospective, which on paper fulfils a didactic role, into a more demanding visual and cultural experience requiring museum goers to understand the implicit concept underlying it thus producing a personal reflection based on the works themselves. There is no traced circuit or invasive explanatory notices. In the cabinet room with the small Berchem landscapes, the commissioner chose to confront very similar works to make the viewer realize (in an attempt to do away with the myth of the artist as always “original”) that a painter like Berchem may use the same formulas and outlines but always creates something personal even if he is recombining already existing elements. In the same way, in the large gallery with the landscapes, port scenes and mythological subjects, visitors are encouraged to compare not only the works but also the content and intrinsic qualities : an arduous trial for the paintings from the first period in Amsterdam but a rich learning experience about the changes in taste of the artist’s patrons, inflamed by dreams of an Italy more myth than reality. The catalogue is just as demanding. It is short, and almost simple in its presentation with just a brief bibliography that contains nonetheless all the major references, including the most recent ones. Its minimalist layout is due to an editor (Ludion) who has already made himself noticed in the past by his original, even radical taste. The quality of the illustrations is remarkable, allowing for excellent comparisons between the paintings (pp. 70-71) as well as the prints (pp. 117-118) and the drawings (pp. 94-96). As for the catalogue raisonnée of the works displayed in the three museums (pp. 134-157) by Luuk Pijl and Pieter Biesboer, the work is impeccable and avoids, a fortunate decision, traditionally hackneyed descriptions. Above all, the articles – with the exception perhaps of a somewhat weak text by Pijl (pp. 73-93) - are of exceptional quality. We cannot avoid regretting the fact that the notion of “painting in the Italian style” was not brought under scrutiny (when in fact the exhibition itself implicitly denies it) or that some simplifications (the “light” in Berchem’s work, the “influence” of Ruisdael, etc) are not pertinent to many of the observations and finally, the lack of information on the artistic relationship between his father (Pieter Claesz) and the artist. Nevertheless, the texts provided shed new light on a number of paintings by Berchem and his contemporaries. The most commendable is signed by Michiel C. C. Kersten and Charlotte Wiethoff on the sense of nature in the XVIIth C. (pp. 39-55). It distinguishes between the modern concept of “nature” – as an environment (Umwelt) inhabited by man – and the idea prevalent among artists of the XVIIth C. of nature as something shared by men and things, including the vision and the feelings projected upon it. Without referring to new sources (mainly antique and modern bucolic literature), the article succeeds in reminding us that these landscapes, considered cold and lacking in “truth” by the XIXth C. (p. 5), are different from those of Van Goyen or Ruisdael because they reflect a different feeling, governed by the idea of nature and the clichés of pastoral literature, which, as demonstrated by Gero Seelig (pp. 59-71) based on numerous documents, XVIIIth C. French artists will, in turn, know how to interpret. In other cases, it is gratifying to see that the authors adopt a cautious methodological approach, such as Annemarie Stefes (pp. 97-115) who, in her article on Berchem’s drawings, insists on the variety within the graphic production rather than trying to reconstitute artificially – and mistakenly – the evolution of a personal “style” or Gerdien Wuestman who, in speaking of Berchem’s prints (pp. 119-132) points out the relatively weak technique of the artist as engraver. By comparing the recent exhibitions devoted to XVIIth C. Dutch painting it is possible to show how to organize a successful show : by selecting the correct audience. The dialogue proposed by the commissioners of Nicolaes Berchem. Im Licht Italiens could only work with alert and knowledgeable – or at least curious – museum goers, willing to make the effort asked of them and, if needed, change their ideas or opinions. It is likely that not everyone managed but many surely did, including the author of these lines, and left the exhibition thinking that they knew Berchem much better than when they entered the Kunsthaus. In this case, the exhibition was a brilliant success and one can only admire an achievement based on radical scientific and editorial choices as well as the courage to implement them, rather than in the simple concern of pleasing and reassuring. Pieter Biesboer, Michiel C. C. Kersten, Luuk Pijl, Gero Seelig, Annemarie Stefes, Charlotte Wiethoff, Gerdien Wuestman, Nicolaes Berchem. Im Licht Italiens, Gand, Ludion, 2007, 176 p., €39,90 (in german). ISBN : 978-90-5544-672-8 (paperbound). Visitor information : Staatliches Museum Schwerin, Alter Garten 3 19055 Schwerin. Phone : 0385-5958-0. Open Tuesday through Sunday from 10 am to 5 pm. Museum admission 6 € - 4 €. Previous article in Exhibitions : L’Œil gourmand. A Journey through Neapolitan Still Life of the 17th century.